My client owned a cocktail table made from a carved teak Indian door with wrought iron hardware, set on legs and covered with glass. It was old, irregular, and beautiful, with intricate hand-carved step moldings, a band of carved deities, hammered brass hardware and an iron latch. She needed three more cocktail tables in the same setting, and after some discussion I made various sketches, all building on the notion of work under glass. I used rough-sawn, seasoned red cedar to build a squat frame for Po Ti's table, choosing all outer surfaces for their prominently raised grain, which was left undisturbed. Into this rough-textured base I set a smooth bowl carved from a solid laminated block of tulip poplar, milk-painted red, oiled, and polished. The second table evolved from a sketch inspired by the work of Mauno Hartmann, a Finnish sculptor. Like the original table with the Indian door, its frame stands on turned legs. The work under glass uses turning, waxed thread, steps, and geometrical openings to suggest an industrial artifact, in blue milk paint. The third table of the set is a quarter sphere mounted on a live-edge plinth block. The spherical shape is made of bent ash staves bound at the top by a peeled pole with a flattened inside face. The overall form suggests a traditional globe-on-stand, while the warm color and soft polish of the ash, and the narrow openings between staves are reminiscent of musical instrument woodwork. 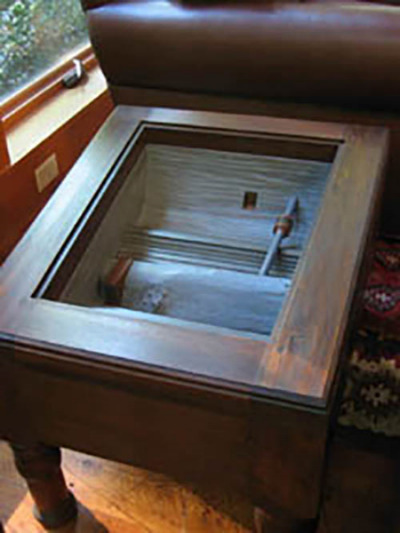 Just under the glass top is an undulating surface carved from solid basswood, and covered with strips of hickory bark, stained, painted, and rubbed through.